One of the most important items in a kitchen is a GOOD knife! Today only and while supplies last this ZWILLING J.A. Henckels Four Star 13-Piece Knife Block Set is just $169.99 (Reg. $350)! Forty years ago, Zwilling J. A. Henckels revolutionized the standards for top-quality knives with the introduction of the seamless synthetic handle. 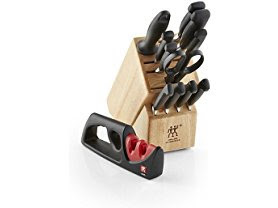 Sitting comfortably in the hand, the knives in this 13-piece set feature broad, strong blades and fine cutting edges . Forged from single pieces of steel the knives are hand sharpened and polished, and perfectly sized and weighted for all kinds of cutting tasks.